" Woden" - Wood Fired Kiln - The Fourth Firing! This page records the fourth firing of the Woden kiln in September 2012. 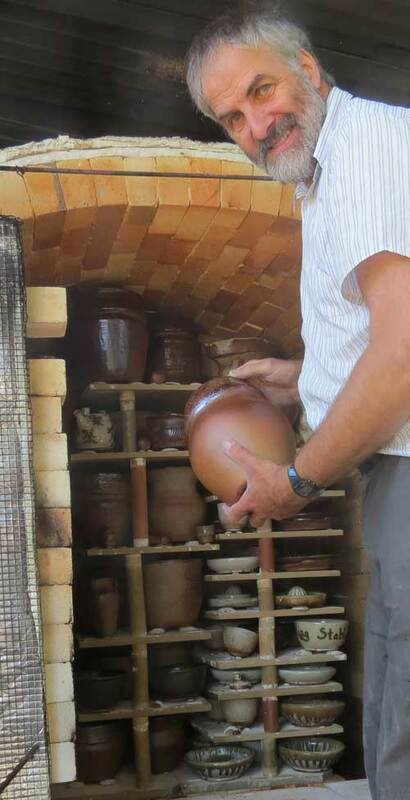 It is an archive of photographs taken during and after the firing. 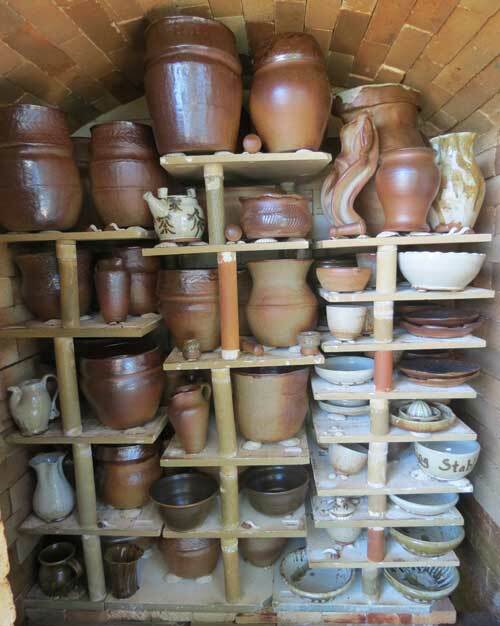 The kiln had no alterations done since the last firing. This firing included a collection of urns made by Bill Crumbleholme over the summer, thrown while demonstrating during Dorset Art Weeks and hand-built using tall coiled sections at the Ancient Wessex Network appearance at Corfe Castle during July. 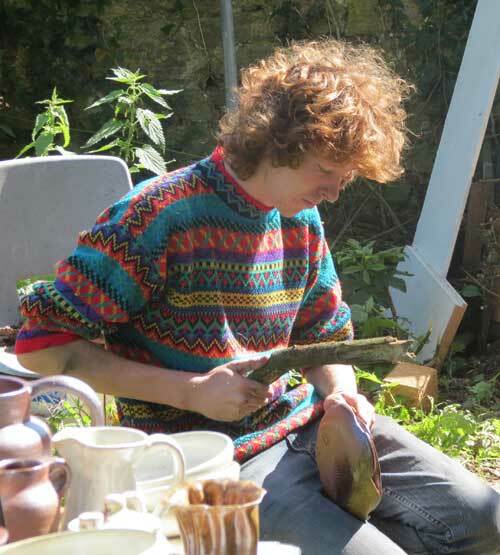 Laurence Eastwood provided a selection of dishes and bowls and a few odd items such as teapots and puzzle mugs. Guest potters submitted their work to the flames, including Jennie Hanrahan, Armin Hermann, Alistair Hampson and newcomer Dale Rossall. 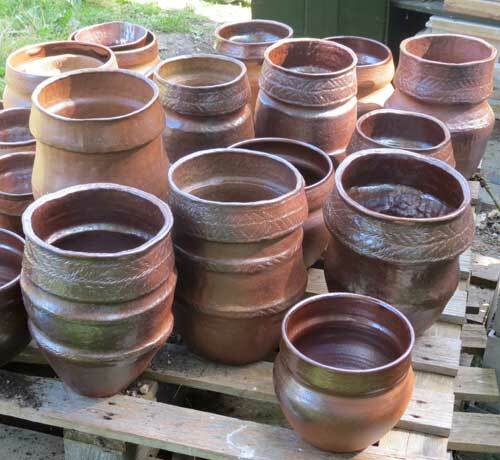 A batch of Bronze Age Style "collared urns", thrown using heavily grogged stoneware clay. This is a YouTube Video of one of these being thrown, it has been speeded up to save time - from 15 to 1 minute. There is no sound. Awaiting photos taken by the loading crew. 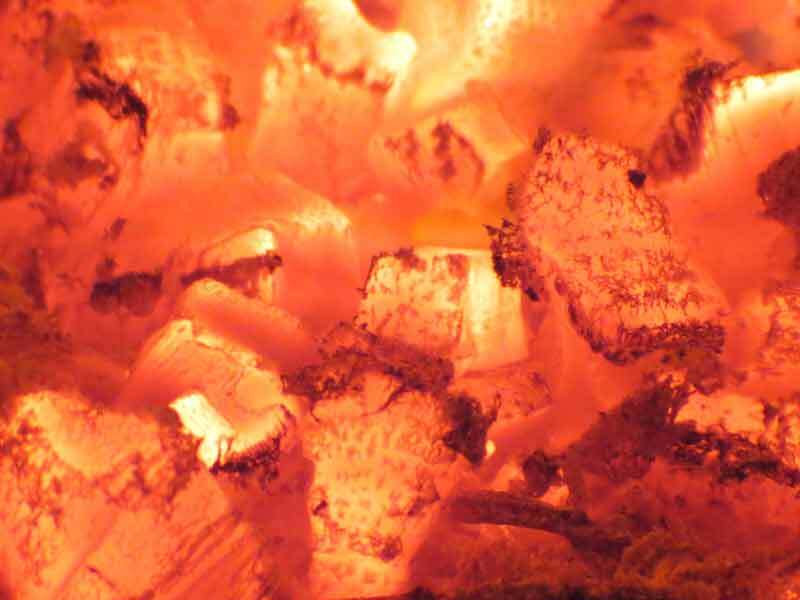 The kiln was preheated overnight, reaching about 250C by morning, with hourly refills of large elm logs in each fire box. During the day, the temperature was built up using elm branches and split logs, with an hour of heavy reduction about 3pm - with the passive damper bricks removed from the base of the chimney to cut down the draw. By 5pm it had reached 1130C - still using elm branches. Cone 8 (1250C) started to bend at 8pm, with the reading of 1190C - out of calibration. Handfulls of small twigs - 1cm diameter & 1m long - were used very effectively every minute or so in alternate fire boxes to raise the temperature to a maximum reading of 1230C at midnight. 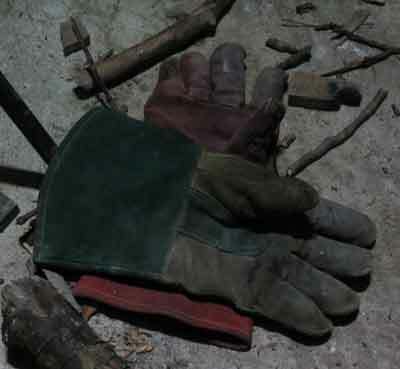 Pallet wood was used as well, but it did not produce enough temperature rise after the fall experienced when it first started to burn. Half an hour after midnight the soaking seemed to be enough, with both cones very bent - as per image shown here. 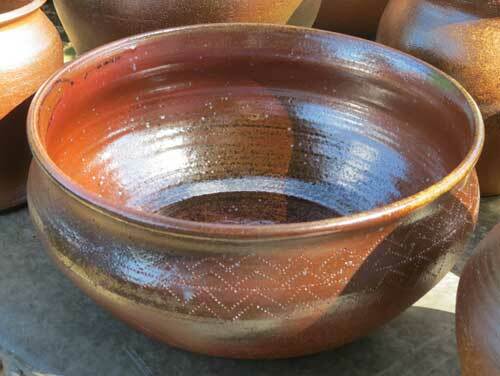 Large elm logs were thrown in and allowed to burn in oxidising mode for an hour - which helps "clean" the firing and produced more shine on the glazes, rather than the slightly matt finish in previous firings. Then the fireboxes were clamped up shut and the chimney dampers opened and the shelf slid across to block off the chimney. The gloves were off for another time! 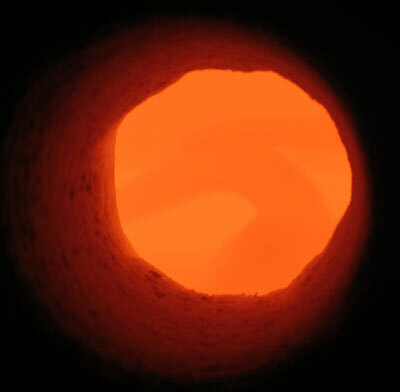 The first look at the opened kiln chamber. And a very good sight it was too! Various degrees of reduction leading to tonal differences. Maybe too much brown!? The pyrometric cones are all well bent over and the glazes look mature. The unglazed areas have a very pleasant sheen and some localised ash blushes. The back stack of shelves, more great results. The right hand side is mainly Laurence Eastwood's dishes, which have felt the high temperatures and flame carried ash deposits. Bill looking happy while unloading his urns. 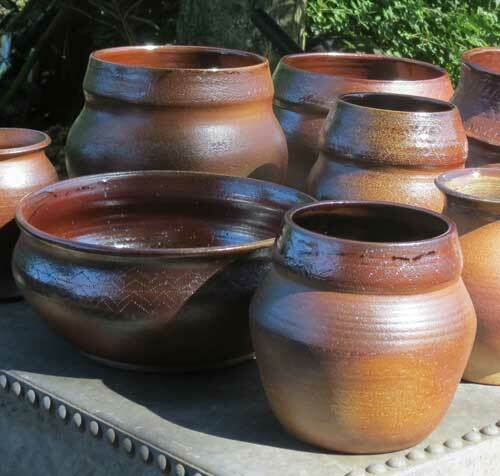 Urns and bowls to delight the eye! There were some sad results, this bowl has a small crack in the rim, where it has sagged due to the extreme heat close to the flames. The other fault in this firing was some glaze crawling. 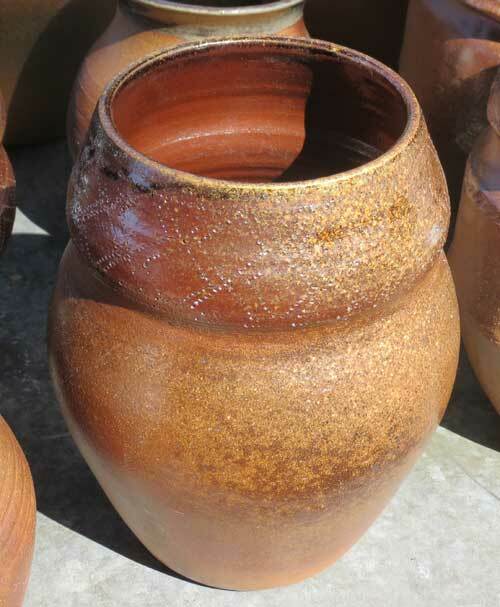 This is Cornish Stone/Whiting glaze with iron oxide, applied to the raw pot. 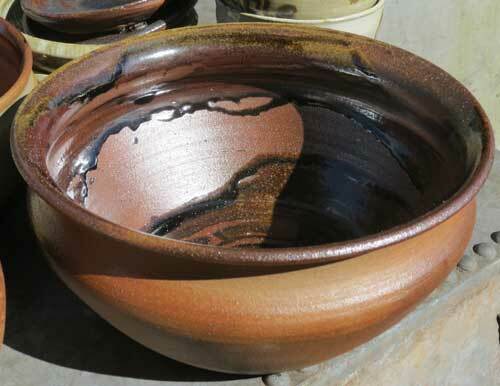 It had been left waiting in a slightly damp store before firing and so the glaze failed to stay gripped. 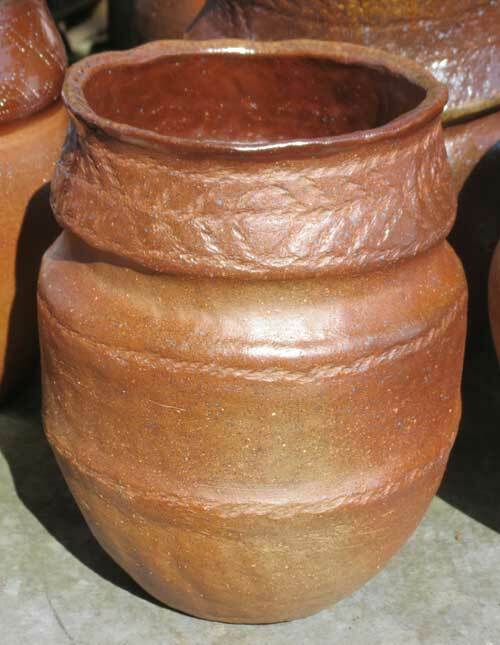 This "collared" urn was thrown and turned to produce a textured surface on the lower two thirds. The top third was impressed with rope decorations. 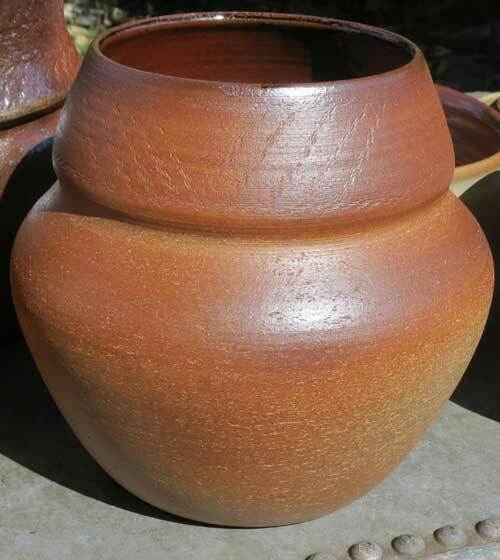 This hand-built collared urn turned out well, with a pleasant toasted surface. A thrown urn which was close to the flames, so has some mottling near the rim. Laurence tried stacking dishes, which he had thrown using square lumps of clay, they had been sprinkled with ash from the firebox and stacked with shells separating them. The ash was a bit too thick in places and smoothered the shells, so they stuck together and needed splitting apart. 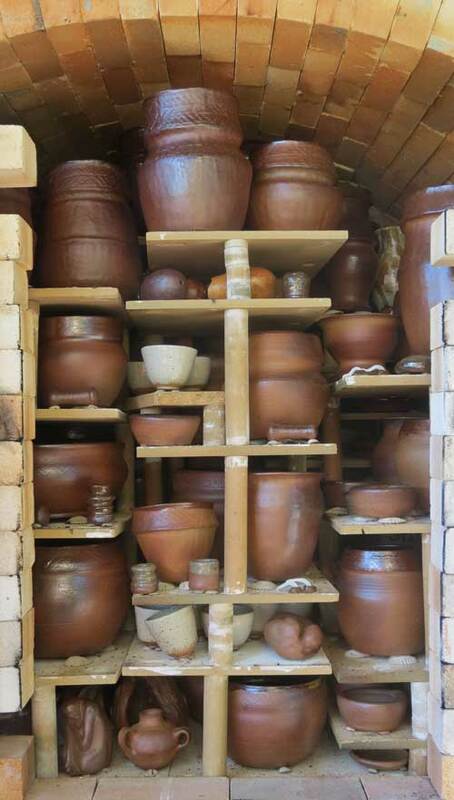 A great collection of urns - all ready for ritual deposits! 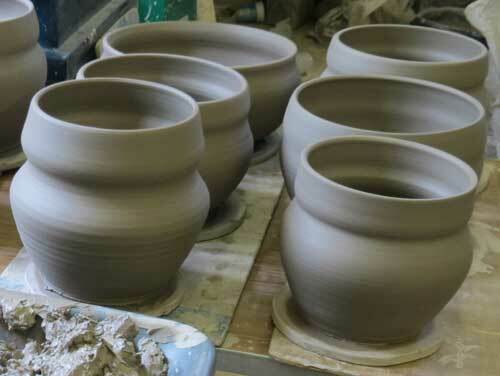 This firing was a great success in general. It was easier to fire, thanks to the reasonable breeze that blew most of the time and kept the air flowing well. The slightly less dense packing may have helped to promote a better firing. The use of twigs and small branches rescued from a tree felled nearby earlier in the year helped to raise the temperature higher than ever before! The baked potatoes cooked very well on top of the chimney tunnel. Everyone who helped and encouraged us and put their trust in us by bringing pots to fire. Thanks again to Luke and Martin for putting up with us.